Maps to the Stars exists in the familiarly twisted, hyper sexual and hyper violent world that spawns many David Cronenberg movies. The film opens with Mia Wasikowska’s Agatha, a wide-eyed Floridian on a bus to the City of Angels, hoping to reconnect with long lost family. With the help of a promise over Twitter from Carrie Fischer, she lands a job as the personal assistant to aging starlet Havana Segrand (Julianne Moore). Havana’s late mother was an iconic actress, and before her death she filmed a classic movie that is set for a new remake. Havana has her eyes set on her late mother’s part; however, she’s is both caught in her mother’s shadow and haunted by hostile visions of her. John Cusack has a role as Havana’s new-age massage therapist who helps Julianne Moore work through childhood trauma in barely clothed sessions. Olivia Williams is his wife, an anxiety-ridden stagemom struggling to come to terms with an incident from her past. Evan Bird is their son, child star Benji, a 13-year old foul-mouthed drug abuser recently out of a stint in rehab. Navigating taboos like the death of children, as well as Hollywood’s incestual nature provides Maps to the Stars with a majority of its subject matter; however, the film stops short of providing an incisive perspective on these ideas. Once the film has seemingly run the course on its commentary, it devolves into an overly bloody, brutal climax. The shocking content is wickedly entertaining, but it only goes so far before being overcome by self-indulgence. 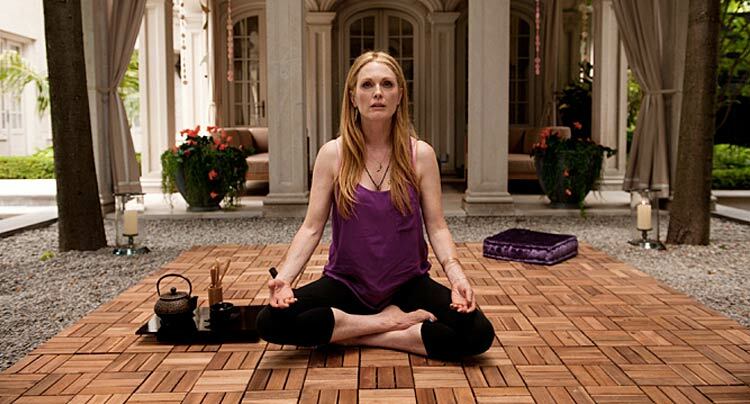 And in a career full of twisted material, Maps to the Stars doesn’t delve into any new territory for a director like Cronenberg.